In the last series, called The Trader’s Pendulum, we took you through the 10 Habits, all aimed to support a successful trader. Your mission in developing these habits is to get out of the Technical Trader’s Trap and transform into an Entrepreneurial Trader so that you can start being accountable to your trading. We invited you to take action and begin your journey by completing the Trader’s Scorecard (www.fxtradersedge.com/scorecard) and to get down to business by arranging a free coaching session. In this Indicator Series, we talk about the mechanics of trading. Bollinger Bands® are a popular indicator developed by John Bollinger in the 1980’s. You will often hear mention of price bands or envelope bands. That is what the Bollinger Bands® are. Bollinger Bands® are derived by taking a simple 20-day moving average and adding a number to get a top band and subtracting a number to get a bottom band. The “number” is 2 standard deviations added to the moving average for the top band and subtracted from the moving average for the bottom band. The way standard deviations work is that 95% of the time, price will fall within 2 standard deviations of a move, which means that when price trades above 2 standard deviations, it will likely come back quickly. In other words, it is overbought. It is also a measure of volatility. When the market takes price too far too fast, the Bollinger Bands® alerts us to that fact. It keeps us from buying highs and selling lows. A 20-day period is optimal for calculating Bollinger Bands. It is descriptive of the intermediate-term trend and has achieved wide acceptance. The short-term trend seems well served by the 10-day calculations and the long-term trend by 50-day calculations. What about using Fibonacci averages like 8, 21 and 55? Sound familiar? Test it out on your preferred markets! The average that is selected should be descriptive of the chosen time frame. This will almost always be different average lengths than the one that proves most useful for crossover buys and sells. The easiest way to identify the proper average is to choose one that provides support to the correction of the first move up off a bottom. If the average is penetrated by the correction, then the average is too short. If, in turn, the correction falls short of the average, then the average is too long. An average that is correctly chosen will provide support far more often than it is broken. Bollinger Bands® attempt to answer the following questions: Is the trend strong or is the trend weak? Is the market overbought or is it oversold? Is a trend reversal imminent or is a correction due? In the chart above, it’s not enough to just to look to sell when price goes above the Bollinger Bands® because as you can see price can track the upper Bollinger Band for many candles before reversing and coming down to the opposite side. Candles tracking the upper Bollinger Band indicate trend strength. Trading bands answer the question whether prices are high or low on a relative basis. The matter centers on the phrase “relative basis.” Trading bands do not give absolute buy and sell signals simply by having been touched; rather, they provide a framework within which price may be related to other indicators, such as an oscillator. If price tags the upper band and indicator action confirms it, no sell signal is generated. Let’s say we have an RSI here and the RSI trades above 80%, and continues to trade above 80% at this point. The RSI doesn’t confirm a sell signal; rather, it confirms a strong trend. If on the other hand, price tags the upper band and indicator action does not confirm it, and it diverges, then we have a sell signal. What that means is if the RSI is only about 60% at this point after having been at 80% with earlier price action, that is called a divergence and then we have a sell signal up here. The first situation is not a sell signal; instead, it is a continuation signal if a buy signal was in effect. It is also possible to generate signals from price action within the bands alone. A top chart formation formed outside of the bands, in the upper right corner of the GBP/USD chart above, followed by a second top inside the bands constitutes a sell signal. So, that would be where price comes down, price moves back up and forms a second top which would constitute a sell signal and would likely take price down to the lower band as in the GBP/USD example. There are two applications that John Bollinger developed, %B and Band Width which are presented in the 15-minute GBP/USD chart above. The indicator %B tells us where we are within the bands. Unlike some oscillators, which are bounded by 0 and 100, %B can assume negative values and values above 100 when prices are outside of the bands. At 100 we are at the upper band and at 0 we are at the lower band. Above 100 we are above the upper bands and below 0 we are below the lower bands. 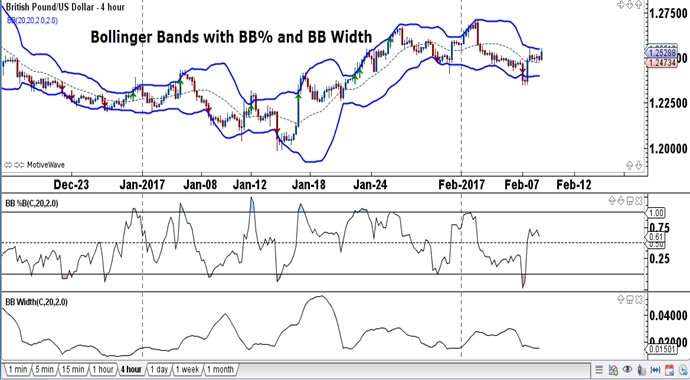 Band Width, another indicator derived from Bollinger Bands®, may also interest traders. It is the width of the bands expressed as a percent of the moving average. When the bands narrow drastically, a sharp expansion in volatility usually occurs in the very near future. 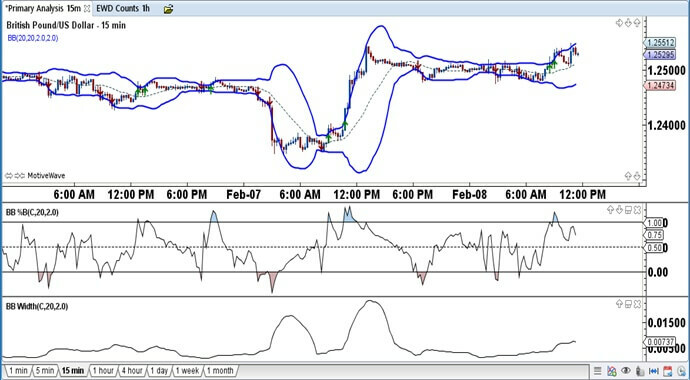 In the chart example, the band narrows during sideways consolidation and then an increase in volatility follows. When one combines this with analyzing the market context to know if the trend continuation will be up or down, a stop-buy or sell can be initiated to trigger a trade in anticipation of the increase in volatility. Trading bands and the accompanying indicators are both good tools, but when they are combined, the resultant approach to the markets becomes powerful. Learn how Bollinger Bands® help define the trends. Start incorporating Bollinger Bands® into your chart set-up. Finally, use Bollinger Bands® in developing trading strategies. See you next week for another “B” indicator! The Trader’s Pendulum: The 10 Habits of Highly Successful Traders. Copyright (c) 2015 by Jody Samuels. This book and ebook is available at all bookstores, online booksellers, and from the Wiley web site at www.wiley.com. This entry was posted in Trading Tips and tagged bollinger bands, forex trading, trading system.